I was diagnosed with Stage IV lung cancer in September 2014. Like many people, my diagnosis came as a huge surprise to me and my family. A friend told us about the Breathe Deep Kansas City Walk that was happening in our area. We called our team The Village People because we like to say, “It takes a village” to fight this thing. 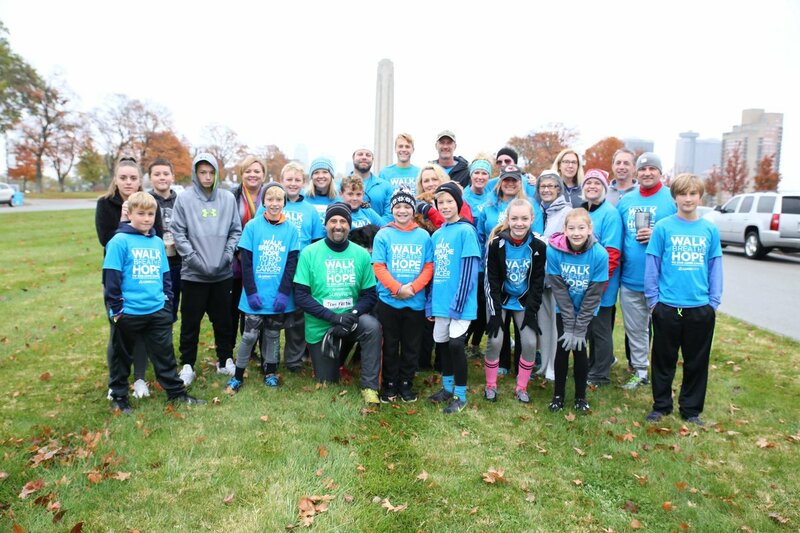 The Breathe Deep walks provide an opportunity to raise awareness and money in your own community. It’s very powerful. I attended my first National HOPE Summit in Washington, D.C. in 2015. Lung cancer is so isolating and overwhelming. Then you get there and meet other survivors and caregivers and experts. I feel like I always leave HOPE Summit with 150 new friends and then I don’t feel so lonely when I get home. The next year my wife and I attended the 2016 Hope Summit together, she finally understood how these friends I had been talking about for the last year could be so intertwined with my health and healing. We made even more friends and keep in touch all year long through social media and other events around the country. Once you get to HOPE Summit, it’s so empowering that you want to get involved. I found out about the LifeLine Support Partner program at HOPE Summit. LifeLine is nice because you can work remotely and there’s an opportunity to give back. My mentor, Matt Ellefson, is one of those people who LF relies on to have multiple mentees and he was very inspirational for me because of our similarities and what we’ve been through. It was a very good fit. LUNGevity tries to match people based on age, gender, diagnosis and geographic location. It’s always felt very comfortable. I’ve had mentees assigned to me and we usually have a really good talk and maybe hear from them once or twice and that’s all they need at that time. We talk on an as needed basis. Hopefully, I’m encouraging people depending on where they are. A lot of the time, the person is newly diagnosed and it’s very fresh with them. As a mentor, you have to put yourself back in that frame of mind. It’s important to remember that you’re not there to fix their situation. You’re there to listen to what they need and let the conversation evolve. The most rewarding thing about being a volunteer is being able to help someone else by sharing my experiences and the ups and downs that I’ve had. If I give any advice it’s always to find a specialist who is an expert when it comes to your diagnosis type or mutation. It’s so important to be very confident in your medical team. Don’t be afraid to get a second opinion. If your doctor isn’t jiving with you, keep looking. It just feels good to help somebody through this because as we all say, it’s really hard for other people who haven’t gone through it to understand. When I was diagnosed, I was given 9-18 months. I’m coming up on 3 years and 11 months and my wife and I are going out to Los Angeles next month for the Stand Up for Cancer telecast on my 4th Cancerversary. I hope that my efforts as a LifeLine volunteer will inspire the people I mentor to do the same for others. I’m a big believer in paying it forward. It’s a big world and there are a lot of people affected by this disease.